Below you will find a Cover Letter Example for a professional with job experience as a Program Manager. It’s a suitable resource for people that have experience as a project manager or a general business manager. This is functional cold cover letter format. This means that the resume is divided by functional categories and can generally be sent to companies regardless of current job opportunities. This is especially true for general management positions where an individual is suitable for multiple titles or roles in a company. In other words, the job target is broad. 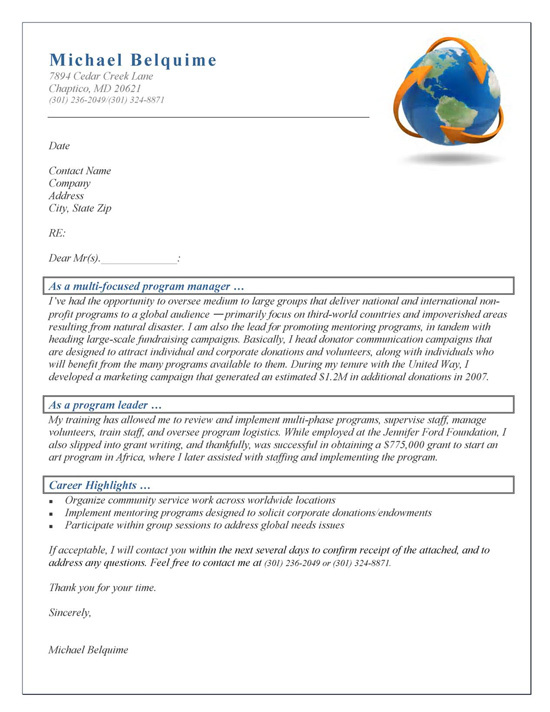 This is a unique cover letter as the writer uses headings above the paragraph that emphasize program management, leadership and career highlights. The opening paragraph documents specific international experience in large scale program development. The closing statement produces a powerful example of success where they generated $1.2 million additional donations. The job seeker goes on to explain their experience in implementing programs, supervising staff, managing volunteers, training and program logistics. Again, they highlight a specific quantified achievement where they obtained a $775,00 grant to start a program in Africa. The writer uses bullet points to highlight organizational skills, mentoring programs and addressing global needs. The cover letter closes by inviting a phone call for an interview. Regardless of the industry, the program manager is going to be a high level professional that gets things done. The ability to lead entire program is not a role that most people can handle, so you may not have much competition. But you better believe that your competition is going to be an expert. If you want to win that job, you will need to put your best foot forward in your cover letter. The program has a goal that must be defined. You will have a role and likely a budget with full P&L responsibility. The reader should know your core responsibility. Try to come up with 5 major accomplishments that each led to a different type of result. For example, an action that leads to saving major costs would be one achievement. Another action might lead to increasing productivity. An achievement can be anything from process improvement to revenue gains. Just make sure to include real numbers, dollar figures and percentages when possible.